The HR35 Series Retractable Box Scrapers meet dirt moving and soil contouring needs of landscapers, contractors, nurseries, sod growers, farmers, ranchers and municipalities. Soil contouring productivity is dramatically increased with utilization of the hydraulically controlled retractable scarifier. 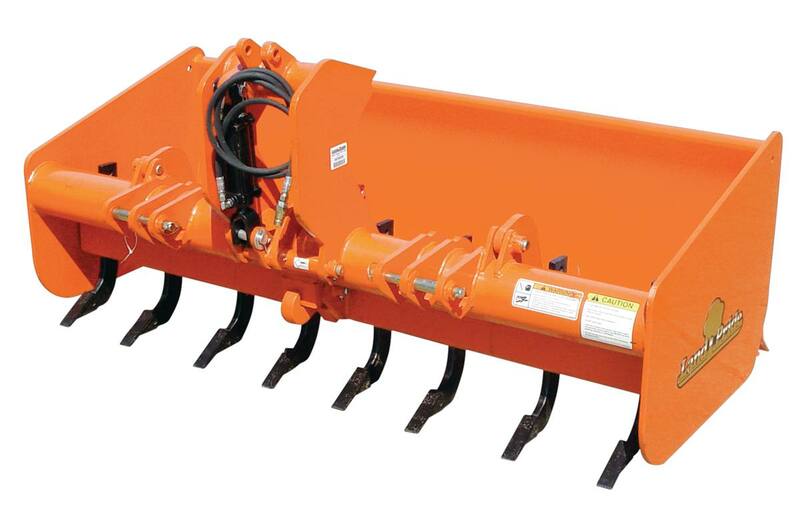 The front blade mounted on the moldboard is ideal for soil redistribution and soil leveling. A second blade mounted on the hinged rear gate further enhances the ability of the Box Scraper to redistribute and level soil. Both the front and rear blades are replaceable and can be flipped over to extend blade life. The HR35 is used for finishing and fine grading when the hinged rear gate is bolted in place. Unbolt the rear gate and the unit’s front blade will penetrate deeper into the soil. Place the tractor in reverse and the rear blade can be used to backfill. 1/2” Heavy Side panels: Thick end panels guard against abrasion. Hydraulic shank tube: Hydraulic shank tube makes for efficient use of time. Clevis-type lower 3-point hitch: Allows for easier hook-up of the tractor’s lower draft arms. 3 Position heat treated spring steel shanks: Positions set for deep to shallow settings. Heat-treated for longevity. Heat treated dimpled on tips: Easy to replace tips that are heat treated for toughness. Heat-treated, reversible and replaceable cutting edges: Heat-treated for hardness. Reversible so both edges can be used before replacing the cutting blades. Category I & II 3-point hitch: Fits a wide variety of tractors. Transport lock on shank tube: Heavy-duty shank lock to keep shanks locked into place during transport. Knurled bushings in upper and lower hitch: Work done with retractable box blades is done forwards and backwards. Bushings at hitch points eliminate premature wear. Heavy Shank bumpers: A 3/4” square steel bumper is located behind each shank for additional reinforcement. Weight (with hydraulics): 981 lbs. Moldboard: Roll-Formed Moldboard - 23 in. Depth of Bucket: 27 1/2 in.